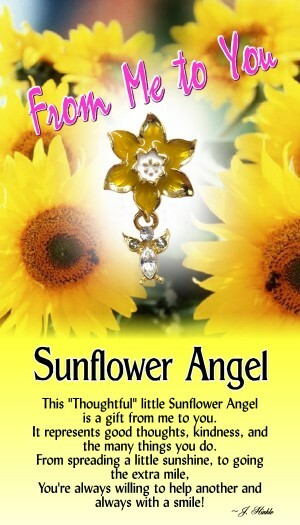 Give our Thoughtful Little Sunflower Angel pin to someone special who is always there for you no matter what. There are always those people who go above and beyond for others in every situation. They are always there to help and lend a hand with a smile on their face. These people are very rare and they should be recognized for their kindness. Our Sunflower Angel pin relays that message perfectly. It’s always nice to know that your good deeds and kindness are recognized and our beautiful pin does that perfectly! Our Sunflower Angel pin features a sunflower with a free hanging angel. The pin is layered in a 14Kt gold finish with hand painted epoxy accents and Genuine Austrian crystals. 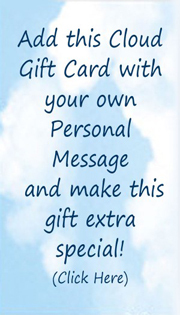 Each pin comes on a colorful greeting card that can be used as a gift card which has a thought provoking verse with a “To and From” on the back giving the ability to sign and address this special gift for that special someone. the many things you do.